Published Sunday, December 23, 2012, OK personal/derivative use; link www.lovethatimage.com. 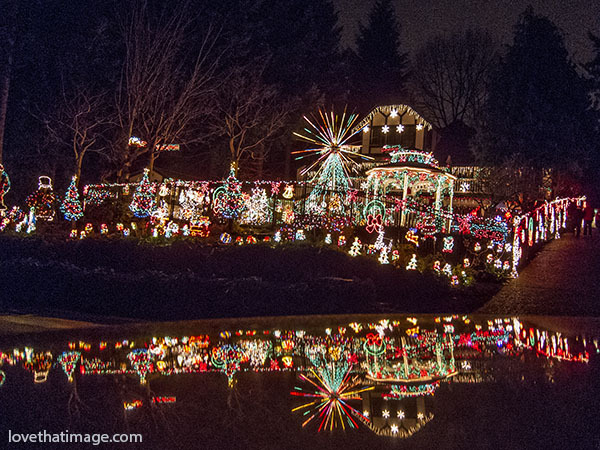 There’s a lady not too far from my house who really goes all out with the holidays. She does amazing things at Halloween and July Fourth, as well. But the Christmas display is my favorite. At this time of year, in this northern latitude, we love lights! 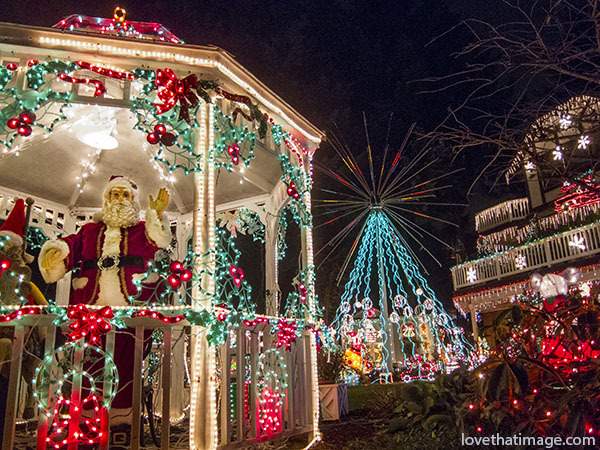 Below is the view from the road in front of her house, showing the reflection on the top of my car as I steadied my camera, and below that is a closer view which includes Santa in the gazebo. There’s a huge Christmas village inside the home, but we’ll save that for another day. Merry Christmas! Visit Outdoor Wednesday, Scenic Sunday, Ruby Tuesday 2, Pink Saturday, Mellow Yellow Monday, and Weekend Reflections. If you’d like to see the latest photos, please click on Sara’s Fave Photos Blog above. Thanks! Wow that is definitely spectacular love it and Merry Christmas! Wow, spectacular lights indeed! Perfect reflection too. I really does look magical, Sara. I am so glad you shared. Spectacular is the exact term : wow ! What a bless it is to be able to see such a magical light profusion… Nice pics, thanks for this lovely sharing ! A breathtaking scene. I loved the reflection look.